Love the private bridge to the Master Bedroom! Vidal Sassoon was the most influential hairstylist of the 1960s–inventing the precision bob and wash & wear hair, freeing women of shalaqued, overly styled hairdos. Sassoon is a lover of architecture, as well as hair. 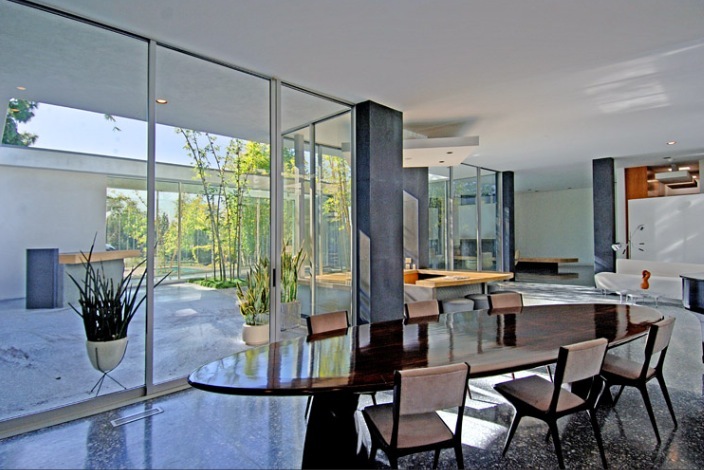 In late 2004, he purchased a Richard Neutra-designed house in Bel Air and oversaw its renovation. And he recently put his 6,189 square foot mid-century architectural home on the market. The home was designed by Hal Levitt in 1962–the same architect who designed Jennifer Aniston’s Beverly Hill’s remodel. This house is located on one of Beverly Hills’ most prestigious streets and has been featured in numerous publications. The gated home sits at the end of a long private driveway and features spectacular unobstructed city to ocean views. The home features beautifully high ceilings, walls of glass, and incredible space for art. There is also a magnificent pool, gardens and a guesthouse. Living in Beverly Hills is like a paradise. This city is considered one of the safest yet beautiful places to live in California.